Sending Baroque Birthday Blessings to Vivaldi! 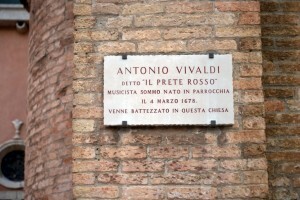 March 4th hosts a variety of birthdays, but let’s take a moment to remember the great Italian composer Antonio Vivaldi. We have him to thank for laying the groundwork of the ‘concerto’, and various inspirational violin pieces that pluck the listener’s heartstrings even today. Here’s our cheerful tribute to Vivaldi and the amazing accomplishments he managed throughout his lifetime! The church in Venice, Italy where Antonio Vivaldi was baptized. Born in 1678, Vivaldi began his music career under the wing of his father, Giovanni Battista, who was a violinist in the San Marco Basilica orchestra in Italy. This was likely a huge factor influencing the approximately 230 solo violin concertos Vivaldi composed over his lifetime. That’s a lot of written music on its own, but it’s only a chunk of the nearly 500 surviving concertos and 50 vocal compositions. His primary focus was string instruments, and The Four Seasons is one of his greatest string compositions. He also earned the title of ‘master of violin’ at the Ospedale della Pietà (Devout Hospital of Mercy) in his birthplace of Venice. Popular with royalty as well, he composed the Gloria e Imeneo just for wedding of King Louis XV. And did we mention the majority of his career he was a priest? Talk about successful! Vivaldi was a part of the Baroque musical movement, which occurred between 1600-1750. Not only was it a transitional period in classical and art music, but it was also a time of exploration and scientific accomplishments. More people were accommodating Copernicus’ theory that the earth wasn’t the center of the universe, and Galileo was making great strides in understanding the universe around us. Vivaldi lived during an exciting time for many aspects of life, and still managed to make his mark amongst an overwhelming variety of musical and scientific geniuses. So here’s to you, Vivaldi—may your music be celebrated for centuries more! Travel to Italy and see Venice in person! AESU offers several trips to Italy, including: Cosmopolitan, Explorer, Euro Focus, Great Escape, Viva Italia, and Euro Spree. Explore Italy and its ancient architecture, plus see Venice and re-live an 18th century reverie. This entry was posted on Friday, March 4th, 2016	at 3:26 pm	. You can follow any responses to this entry through the RSS 2.0	feed. Both comments and pings are currently closed.